Within each cell of every human being lies a profound playfulness. This quality has taken on many names throughout written history, but has most often been referred to as one’s inner child. It is the source of unfettered imagination, the purest form of laughter, and complete lack of self-consciousness. For most individuals, however, this innate quality becomes more and more difficult to access with age. Visceral Recess encourages its guests to carve their own path back to their intrinsic playfulness by leveraging a seamless collaboration of technology and whimsy that will help them locate their intrinsic self. Future Wife, LLC strongly believes that interactive technology can be a potent tool in the quest to regain one’s childhood imagination. By asking guests to engage in a certain kind of whimsically uninhibited physical exertion that requires the externalization of their inner child, they build valuable neural connections that they can later use to return to their innate playfulness. 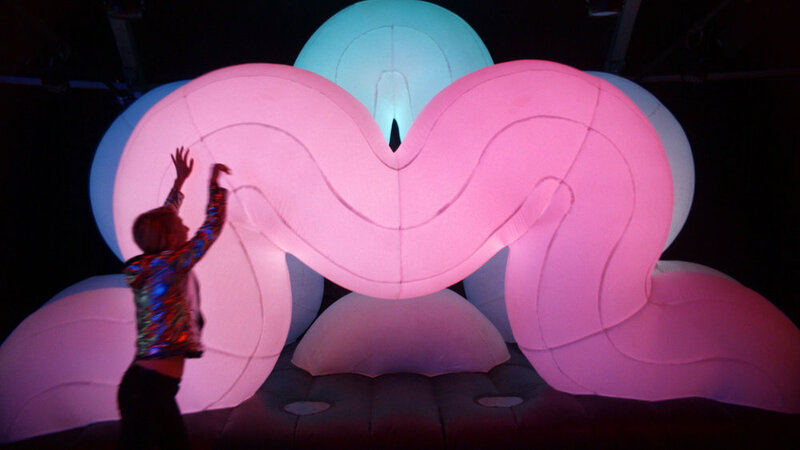 For the 2016 Panorama Music & Art Festival, Future Wife created an inflatable that allowed guests to climb in and explore. Once inside, the light animations and sound environments react to their movements as they jump, bounce, roll and tumble.